Weapons Code - De website van brothersinexile! "Respect is earned, Loyalty rewarded." There shouldn't be too much to say about this. As an MC crew, we naturally go with a couple of bylaws. Naturally, 1% mentality forbids explosives and heavy weapons. Still, our version includes a couple of things, but we refrain from using them until provoked with the same as freeroam fights are often AR only. Also, if you wish to do the cowardly move of riding around on bikes while we have a freeroam 1% fight, expect to be blown off your bike every time until you man up enough to come down and fight. When it comes to public sessions and randoms with no MC affiliation that also follow no MC rules known to man, then by all means, use equal force. This is the club's code of weapon whitelist. Read it, study it, apply it. That should cover the realism side of weapons. 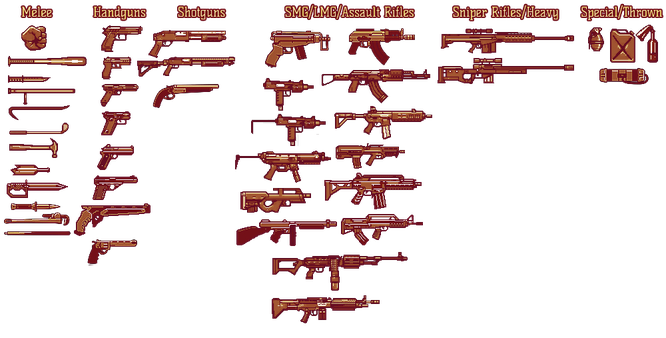 Further weapons can be added after discussions. This weapons clause will be handled in our private events and our missions/events will be created with the weapons clause in mind!